Nobody should ever go a day without a reason to smile. Help us spread joy! 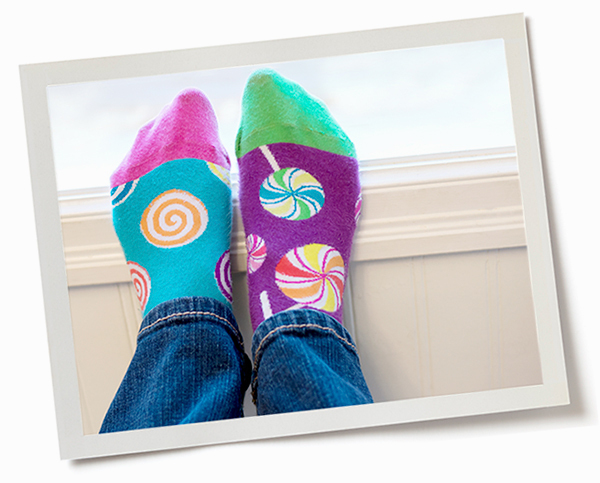 Giving someone who is struggling a pair of unexpected, fun socks changes their day. When done continually in organizations, it can spread contagious joy – even in the darkest times. You donate the $$ and we purchase fun socks on your behalf. Even a $10 donation can buy 7 pairs of socks – that’s 14 happy feet! If your company makes a donation, we send you a receipt and include your company as one of our donors when we donate the socks. It’s some advertising for your business as well as a meaningful way to give back. “Just wanted to thank you again for the wonderful, fun, thoughtful gift of Joy Socks. Every family member who comes to stay at Ronald McDonald House will be receiving some socks in their welcome bag. Perhaps the group that will benefit most from your gift are our teenagers. When people think of RMH they often think of the little ones but forget that teenagers also get cancer, get in accidents, etc. We have very little to offer them in welcome bags as no one donates for teens so these socks are extremely welcome. We definitely would love to continue the relationship and will let you know when our supplies get low. You have your people collect new, colourful socks in your school or business. We collect them and we will gift wrap them and deliver them to one of our donation sites. We will give your organization a shout out for donating the socks. Join the G4orce leadership program for kids grade 4-9. They identify a fun and easy way to collect socks in their school or community and we will provide them with a positive and impactful leadership program that includes the 4 ‘G’s of impactful leadership. Those same 4 ‘G’s also are the keys to becoming a more positive and impactful person. Every participant will receive a leadership certification upon completion of program. The 4 “G’s are becoming more Genuine, Grounded, Generous and Grateful. Each session will include interactive learning opportunities, goal setting and accountability. We will also be bringing in local business leaders to share the story of how they became the leaders they are today and what steps they had to take to get to where they are. We will meet for 2 hours, 4 times over the year to help them develop their leadership skills to make a positive impact in the world. The Impact will accelerate these budding leaders to have a big impact in the world, knowing that they bring specific gifts and talents to the world and that they’re here to make a difference that only they can. You collect socks or money at your workplace, we will gift wrap the socks and donate them on your company’s behalf at Christmas. You can even suggest a donation site that’s close to your organization’s heart. If you’d like an opportunity to help with Joy Sock deliveries to our donation sites, help with fundraising events, or just be kept aware of where there is a need that you might like to help with, then sign up to be a Joy Sock ‘Sole’dier.